Every diamond is breathtaking in its own way, but we see the ten classic diamond shapes trending at different times. Recently we’ve noticed that oval and pear shaped diamonds are increasingly sought after by couples selecting diamond engagement rings. Both shapes are timelessly elegant, but more distinctive than round and square cut diamonds. Because of their relatively long and narrow shapes they visually elongate fingers, for a very flattering look. If you’re enchanted by these diamond shapes, here is what you need to know about each, as well as the most popular engagement rings featuring oval and pear-shaped diamonds. 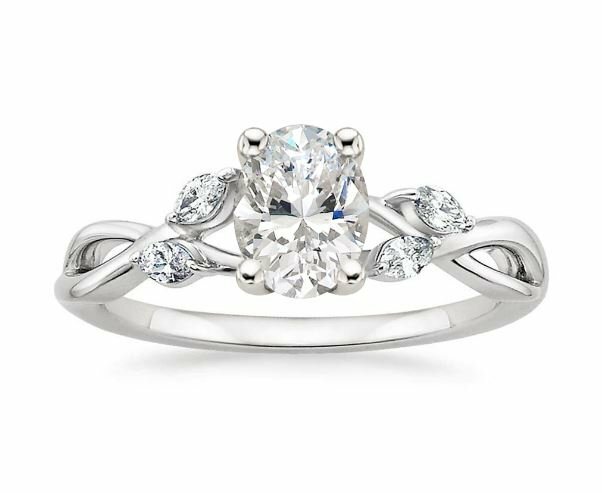 Oval diamond engagement rings are a perfect choice for the bride who loves the classics but craves something just a little bit distinctive. 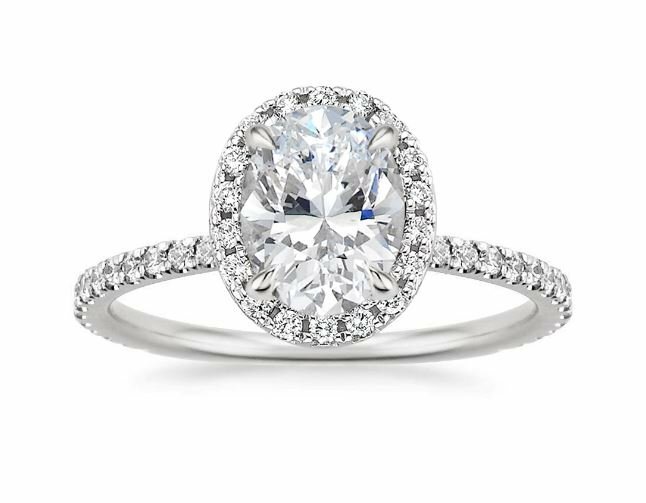 Oval diamonds possess the brilliance of round diamonds but are less expected, as round diamonds are still the most popular choice for engagement rings. 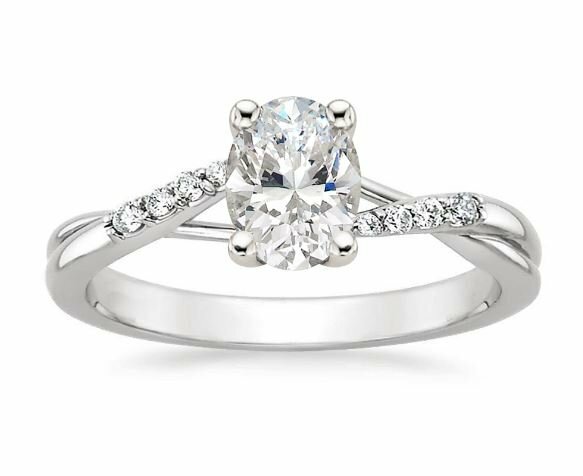 Oval diamond engagement rings are also a great option for the budget-conscious, as the oval cut maximizes surface area and gives you the look of a larger diamond at a lower price. 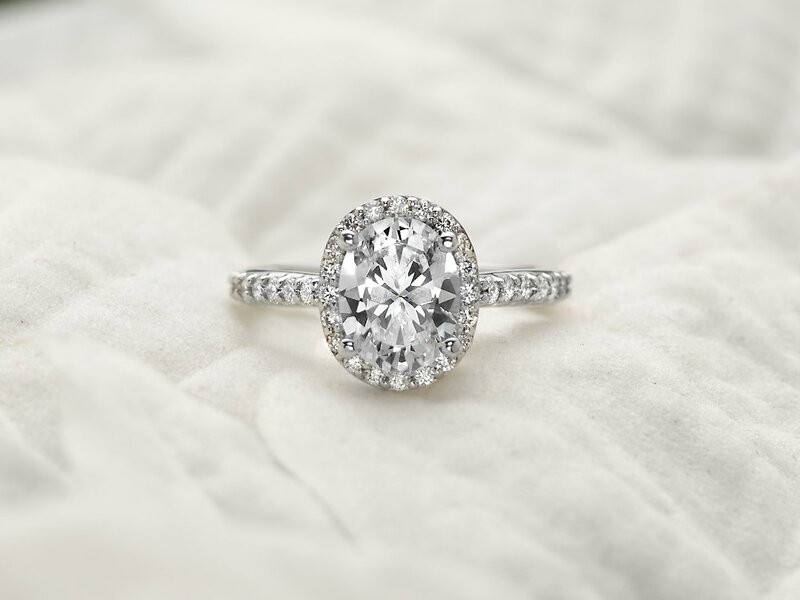 When choosing an oval diamond, pay attention to the length-to-width ratio. The most traditional oval diamonds feature a length-to-width ratio ranging from 1.3 (a more rounded shape) to 1.6 (a more oblong look). The sparkling halo setting of the Waverly Ring surrounds an oval diamond with scalloped pavé diamond accents that make the center diamond appear larger. More diamond accents adorning the band and the gallery add spectacular shimmer from every angle. The Petite Twisted Vine Diamond Ring‘s center oval diamond is made even more dazzling by the twisting strand of diamonds entwined with a high polished ribbon of precious metal. The intricate halo of diamonds on the Fancy Halo Diamond Ring with Side Stones embraces and accentuates an oval diamond, while diamond accents on the band equal dazzling beauty. 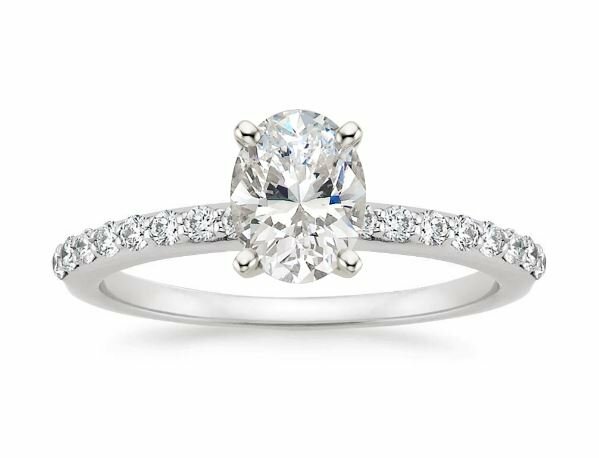 In the classically beautiful Petite Shared Prong Diamond Ring, the center oval gem appears to float above the delicate band. 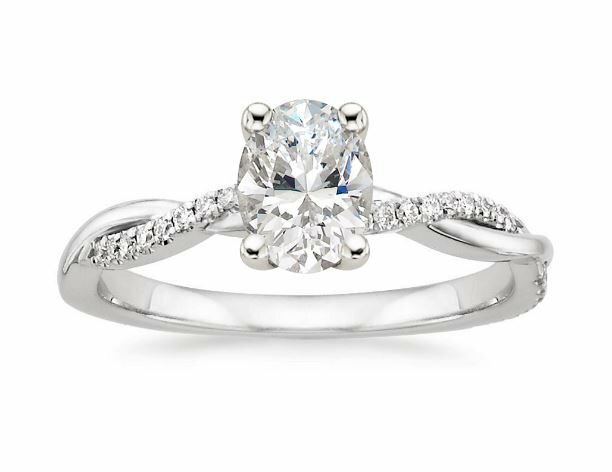 Diamond accents provide sheer sparkle in this classic ring. This artfully sculpted ring features ribbons of precious metal delicately entwining around the oval diamond for a classically elegant look with a contemporary touch. Tapering diamond accents on each side add even more shimmer. Pear-shaped diamonds have been a symbol of love for centuries—in the late eighteenth century French emperor Napoleon gave his beloved Josephine an engagement ring featuring a pear-shaped diamond alongside a pear-shaped sapphire. But despite their storied history, pear engagement rings have been a relatively uncommon choice until recently. Sometimes called teardrop diamonds, this diamond cut is a modified round brilliant cut, meaning that it features 58 facets and the dazzling sparkle of a round diamond. 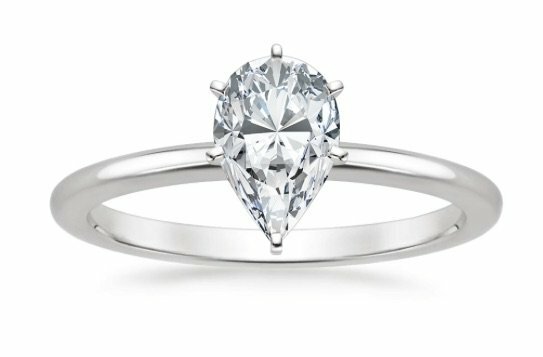 When choosing a pear-shaped diamond, look for the rounded edge of the diamond to be even and symmetrical, with the point of the teardrop falling directly in between the two rounded edges. As with oval shaped diamonds, look for a length-to-width ratio of between 1.4 and 1.7. Often women who receive a pear diamond engagement ring are uncertain how to wear it. Of course you can wear the ring whatever way you want, but these rings are traditionally worn with the tip of the diamond pointing toward your fingernails. 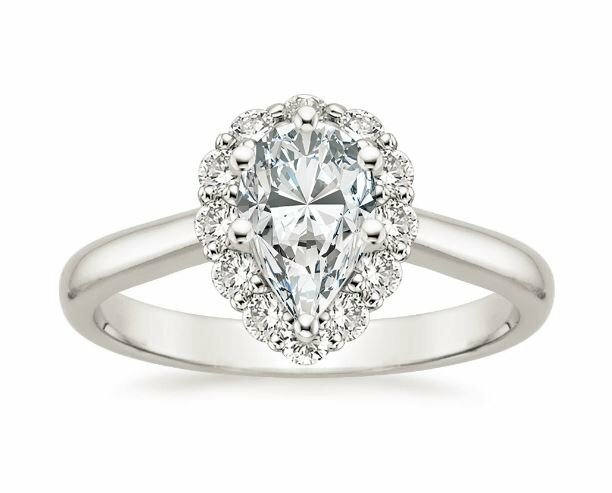 A subtle floral diamond halo blooms around the center pear-shaped diamond in this exquisite ring. 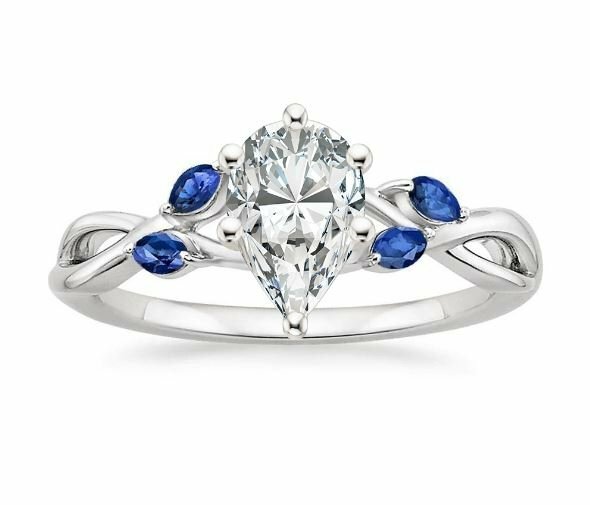 A distinctive, nature-inspired design, the Willow Ring accents a pear-shaped diamond beautifully with four marquise shaped sapphires. Two rows of pavé diamonds sparkle on this contemporary split shank band, while a halo of diamond accents gently curve around the center pear diamond, creating a distinctively glamorous look. With a delicate profile and a timeless beauty, the Six-Prong Petite Comfort Fit Ring showcases a pear diamond in a secure six-prong setting, with a smooth, gently rounded band. 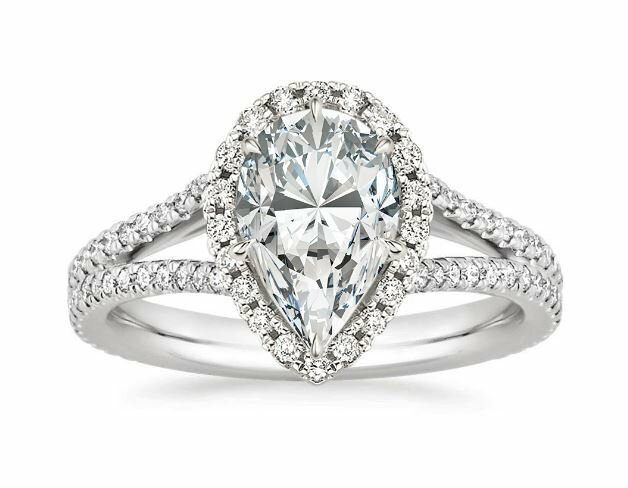 The sparkling halo setting of the Waverly Ring surrounds a pear diamond in scalloped pavé diamond accents that enhance the look of the center diamond. More diamond accents adorning the band and the gallery add spectacular shimmer. 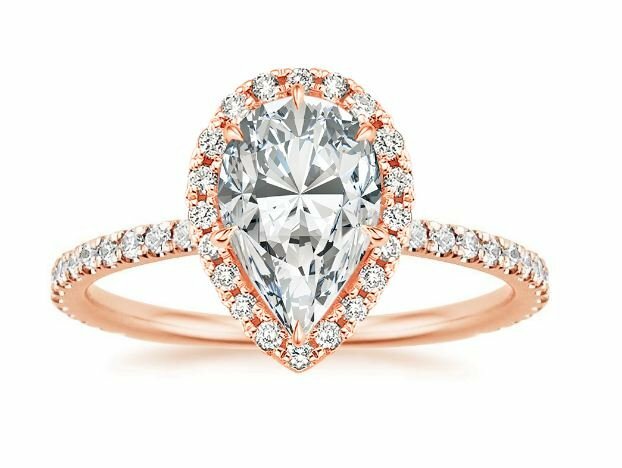 What do you think of oval and pear diamond engagement rings? Which ring design is your favorite? Let us know on Instagram, Facebook or Twitter, or in the comments section!